Today I’ll go through the solution to the chess problem I posted two weeks ago. If you’re still stuck, another hint is that the solution involves multiple lines of play to consider. You can find my solution after the break. The correct move is Qh5!, as shown below. A complicating factor is that the move does not place Black in check, so there are more possible responses; we’ll go through each in turn. 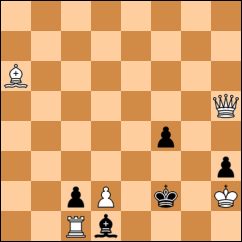 If Black responds with Be2 then Qxe2 is mate. If Black responds with any other move of the bishop (including the superficially best-looking move Bxh5) then Rf1 is mate. If Black moves their pawn (f3) then Qh4 is mate. Finally, if Black moves their king (Ke1) then Qe2 is mate.